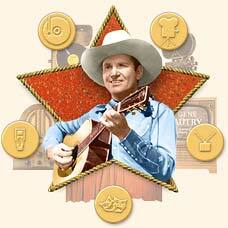 Known as "America's Favorite Singing Cowboy," Gene Autry is the only entertainer to have five stars on Hollywood's Walk of Fame, one each for radio, records, film, television and live theatrical performance (including rodeo). In his ability to transcend media and in the sheer scope of his output, Gene Autry was unsurpassed as a popular image-maker of the American West. In this area of the site you can explore Gene's life and career as an entertainer and friend to millions.